Photo on left: John Beasley, MD (left) congratulates James Damos, MD. Photo on right: Paul Hunter, MD, (left) and Marc Hansen, MD. 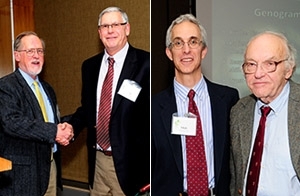 The Department of Family Medicine (DFM) held its annual Renner/Hansen Awards Ceremony on Wednesday, November 5, 2014, at the Pyle Center in Madison. James Damos, MD, the founder and retired director of the DFM’s Baraboo Rural Training Track (RTT), received the John H. Renner “Wisconsin Idea” Award. This award recognizes a citizen of the State of Wisconsin who has demonstrated an exemplary commitment to family medicine and the health needs of the people of Wisconsin as envisioned by the late Dr. Renner. Dr. Damos led the Baraboo RTT from 1996, when it was established, until 2010, when Stuart Hannah, MD, took over as program director. The program has had an outstanding track record of training physicians for rural practice, and has been nationally recognized as a model for rural graduate medical education. In addition, Dr. Damos, in collaboration with the DFM’s John Beasley, MD, created the Advanced Life Support in Obstetrics (ALSO®) course, which has trained more than 70,000 maternity care providers in the U.S. and more than 160,000 worldwide since 1993. Paul Hunter, MD, received the Marc Hansen Lectureship Award. This award honors a junior faculty member who has made a substantial contribution to the education of students and residents. Dr. Hunter is an assistant professor at the DFM who teaches students and residents at our affiliated Milwaukee residency program. He’s also a scientist at the Center for Urban Population Health, and the associate medical director for the Milwaukee Health Department. DFM Associate Professor Joan Hamblin, MD, and Professor Sarina Schrager, MD, MS, received the Faculty Excellence Award in recognition for their performance and service to the mission of the department. Dr. Hamblin is the director of the DFM’s Eau Claire residency program and the medical director of the UW Health Eau Claire Geriatric Assessment Clinic, which is part of a Wisconsin Alzheimer’s Institute consortium. Dr. Schrager cares for patients and teaches residents at the Northeast Family Medical Center, and directs the DFM’s academic fellowship. Tanya Schlam, PhD, for her outstanding student research project. Team members included Terri Carufel-Wert, RN, BSN, MHA; Justin Knupp, MBA; and Kirsten Rindfleisch, MD. They piloted an electronic survey – in English and Spanish — to capture care patient feedback at hat clinic, as well as at the UW Health Arboretum Clinic.